Holzer Health System welcomed its New Year’s Baby, Waylen Lee Fowler, born at 5:45 a.m. on Jan. 1 at 8 pounds and 2 ounces and 21 inches long. Shown pictured are Waylen with his parents, Wesley and Alexandria. He is also welcomed by big brother, Colt. 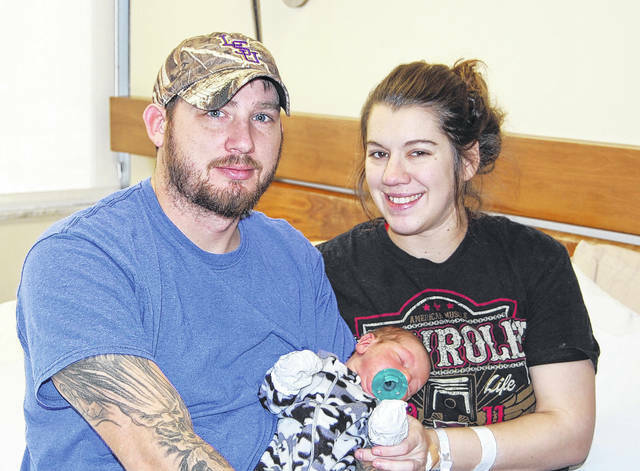 The Fowlers are residents of Culloden, W.Va.
https://www.mydailytribune.com/wp-content/uploads/sites/42/2018/01/web1_new-years-baby-2018-1.jpgHolzer Health System welcomed its New Year’s Baby, Waylen Lee Fowler, born at 5:45 a.m. on Jan. 1 at 8 pounds and 2 ounces and 21 inches long. Shown pictured are Waylen with his parents, Wesley and Alexandria. He is also welcomed by big brother, Colt. The Fowlers are residents of Culloden, W.Va.